Step by step to upgrading LibreOffice - Finally, The Document Foundation announced and released LibreOffice 5.0. For Ubuntu 15.10, 15.04, 14.04 and 12.04, also for derivatives. 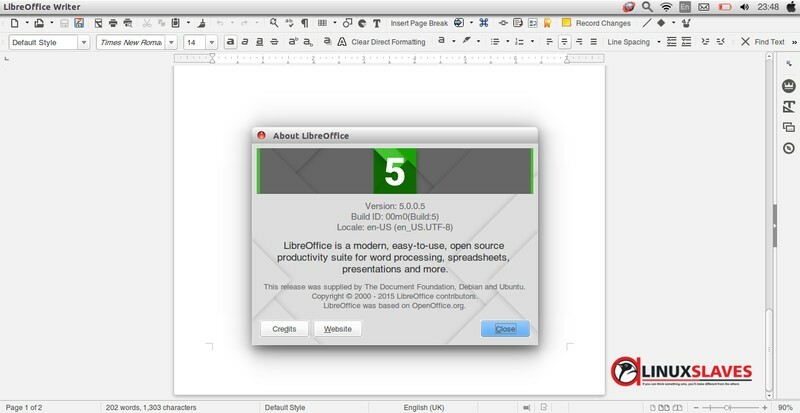 Yep, LibreOffice is Free and Open Source Software. Development is open to new talent and new ideas, and their software is tested, used daily by large and devoted user community. What new in LibreOffice 5.0? Spreadsheets that rock : LibreOffice 5.0 ships an impressive number of new features for its spreadsheet module, Calc: complex formulae image cropping, new functions, more powerful conditional formatting, table addressing and much more. Calc's blend of performance and features makes it an enterprise-ready, heavy duty spreadsheet application capable of handling all kinds of workload for an impressive range of use cases. Beautiful office suite designed by a fantastic community : New icons, major improvements to menus and sidebar : no other LibreOffice version has looked that good and helped you be creative and get things done the right way. In addition, style management is now more intuitive thanks to the visualization of styles right in the interface. Better filters, better documents : LibreOffice 5 ships with numerous improvements to document import and export filters for MS Office, PDF, RTF, and more. You can now timestamp PDF documents generated with LibreOffice and enjoy enhanced document conversion fidelity all around. Better, faster, more stable : LibreOffice 5 combines innovative features and long term efforts towards enhanced stability. As a result, expect both improvements in performance and in stability over the lifetime of the 5.0.x series. To make linux commands more simple, you can setup the bash aliases to make shortcut. It will be help you to quickly write long command line interface. Read Bash Aliases : Create Linux Command Line Shortcut. Another way to upgrade is via Software Updater. Open Software Updater/Update Manager, give them (all updates for LibreOffice) checklist then hit Install Now. Updated! Newer LibreOffice is ready to download. Check our new post LibreOffice 5.2 Released See Whats New Here. 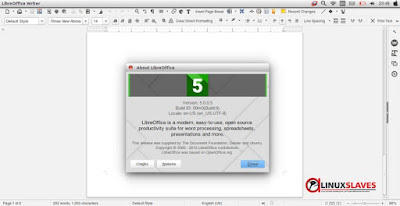 That's all I can write about LibreOffice 5 released and how to upgrade to LibreOffice 5.0. Hope you've enjoyed reading this tutorial as much I’ve enjoyed writing it. Thanks for visiting us.